Introduction to the "Nihonmatsu Chrysanthemum Figures"
Since 1955 chrysanthemum figures exhibition was held at Fukushima Prefectural Kasumigajo Castle Park (national designated historic site Nihonmatsu Castle ruins). 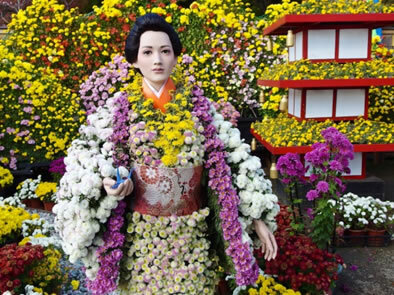 It is an event representing Nihonmatsu as one of Japan's foremost celebrations of chrysanthemums that is a festival of the colors the autumn of Tohoku. Introduction to the "Senrinzaki of Nihonmatsu"
One of the centerpieces of the "Nihonmatsu Chrysanthemum Figures" Exhibition is the "senrinzaki. 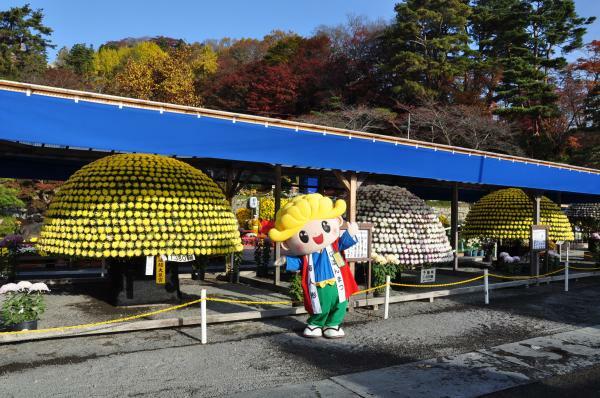 "As the name implies, the "senrinzaki" is made of chrysanthemum flowers from one stem and made into a dome shape with one thousand flowers, grown over the course of two years and large ones are four meters in diameter and more than two meters in height. "How to make a Chrysanthemum Figure"
First of all, make the "body skeleton" which becomes the groundwork to attach the chrysanthemums. The body skeleton is a combination of "makiwara", which is made of bamboo and rolled rice straw with yarn, and a three-dimensional shaped figure is created. 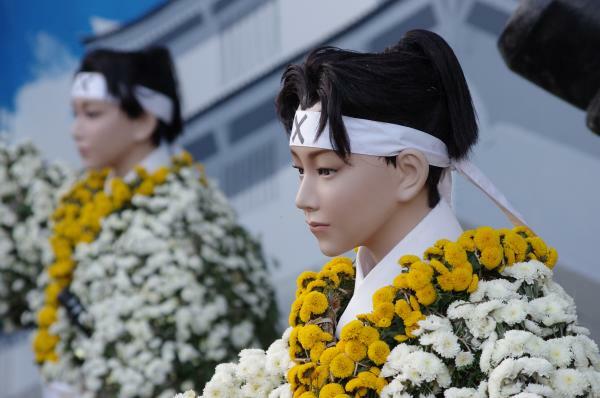 The task of arranging the body skeletons in accordance with the movement of the person is called "building" and the craftsmen who do the work of “attaching chrysanthemum” flowers on the built-up body skeletons are called "chrysanthemum masters." The attachment of the chrysanthemum entails sticking a cypress leaf to the body skeleton and on top of that a chrysanthemum with its root attached is wrapping around the root so that it is tied to the skeleton aligned with the surface and, then, the bundle of chrysanthemum wrapped in water moss and the bundle is stuffed into the skeleton and is affixed to the skeleton starting from the collar downward with rush. Using 50 to 60 chrysanthemum bundles per body, even skilled craftsmen are told that it is the best to put on 1 body a day as the task needs technical precision and persistence. As the flowers will wilt in a week to 10 days and the best time view the flowers will be over, the flowers will be "replaced and attached" 4 to 5 times during the festival. As the flowers are replaced a number of times during the period of the festival, different designs of kimono may be seen every time you go to the exhibition hall. There is also a corner for a public demonstration of attaching the chrysanthemum. Up to completing the "senrinzaki"
As its name suggests, over one thousand flowers bloom from one stem to finish in a dome shape, which takes about two years for cultivation, the larger ones can be 4 meters wide and 2 meters high or more. In the first year, the winter solstice buds that have been cultivated from around the autumn of the previous year until January of the next year are propagated of by separation at their roots and the "herbaceous cutting" is undertaken from March to April. Over May to August, the numerous roots are allowed to spread out and, in order for them to grow into large plants, and are gradually replanted in larger and larger pots. Utilizing the nature of the chrysanthemum having flower buds when the sunshine time is short, in the first year light is shined on the flowers during the evening from August to around April so that the flowers can grow without blooming. Following that, top pinching is continuously repeated and the number of branches is increased. 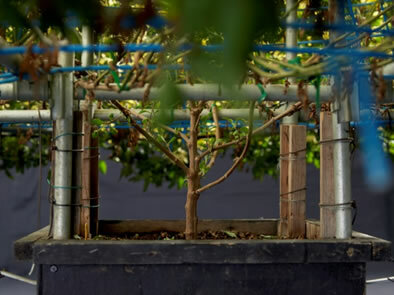 In July, "shading" is undertaken by putting the plants in a darkroom before sunset - as a rough guide three months before the flowering time - and the time of sunshine is shortened to allow the plants to form and encourage preparation for flowering. In September, while attaching bud by bud to the "wheel" in order to support the flowers, branches are threaded to conform to the dome-shaped frame and the flowers are fixed into position. 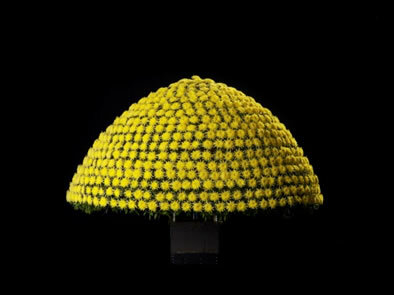 The "senrinzaki" that fully blooms in unison from October to November moves the hearts of those who see it as the highest masterpiece produced by the chrysanthemum masters. If you look at senrinzaki from the bottom, you can see that the root is really made from one plant. 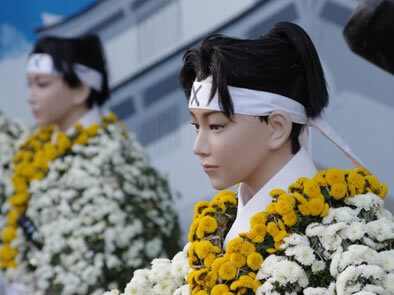 Also, you can see 5 to 7 senrinzaki of this scale at one time only at the Nihonmatsu Chrysanthemum Figures Exhibition.